The 1983 Auburn Tigers football team represented Auburn University in the 1983 NCAA Division I-A football season. Coached by Pat Dye, the team finished the season with an 11–1 record and won their first Southeastern Conference (SEC) title since 1957. The squad featured several star players who went on to long professional careers including Bo Jackson, Randy Campbell, Tommie Agee, Lionel James, Donnie Humphrey, Steve Wallace and Al Del Greco. Prior to the season, Dye became the first coach in the SEC to require players to take blood and urine tests for drugs. Also prior to the season, fullback Greg Pratt collapsed after making his required time in running tests and died a short time later. The team capped a stellar 11–1 season, squeaking off with a victory over Michigan in the Sugar Bowl 9–7 in the final seconds. Despite entering the bowl games ranked third in both major polls, and with both teams ranked higher losing their bowl games, the Tigers ended ranked third in the final AP and the UPI Coaches' poll as Miami jumped from 5th from the AP and 4th from the UPI Coaches' poll to claim the AP/UPI Coaches' National Championship award. Auburn had played the toughest schedule in the nation, including nine bowl teams, eight of which were ranked in the top 20 (four in the top ten), and two teams Auburn faced would compete against each other in the 1983 Florida Citrus Bowl (Tennessee won the game against Maryland 30-23). Also, Auburn beat Florida by a touchdown 28-21, the same Florida team that defeated Miami in the beginning of the season by a 28-3 score. The Tigers did finish ranked first in a few polls including the computer rankings utilized by The New York Times. 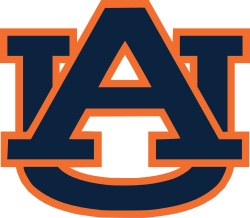 ↑ "Auburn Testing Players for Drugs". New York Times. 1983-08-22. Retrieved 2010-09-05. 1 2 Barnhart, Tony. "Auburn Wins 1984 Sugar Bowl, but National Championship Still Eludes Tigers". The Atlanta Journal-Constitution/CBS. Retrieved 2010-09-05.